Spent a week localizing in Sucre, Bolivia. This is what we ate. We spent a leisure week in Sucre, Bolivia vegging out. We did absolutely nothing but took Spanish lessons and ate some of the best food Bolivia has to offer. Here’s what we put in our tummies! 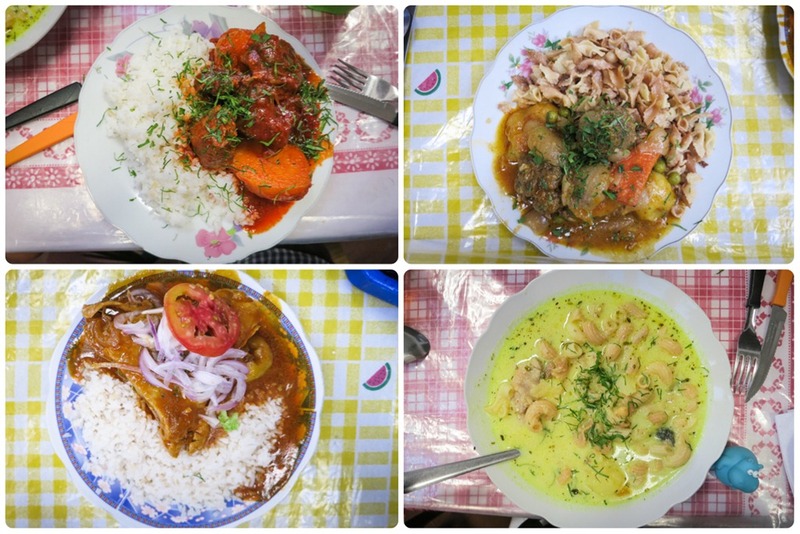 Traditional Bolivian dishes from Mercado Central. We frequented the local market to venture through the food stalls upstairs and share a traditional Bolivian plate or 2 (portions are huge!). A plate can cost roughly 10 Bolivianos or $1.50 USD and consists of noodle soup or albodigas (meatballs) with carrots, potatoes and onions served with rice or pasta. Fruit salad bowls from Mercado Central. 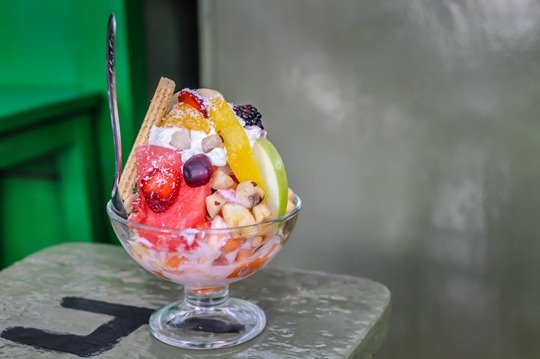 A great way to start your day is a stop at the fruit stalls at Mercado Central for a decadent bowl of fresh fruit salad – made to order. Get an ensaladas en vasa. It has mixed fruits like banana, strawberry, watermelon, apples, mangos and papaya topped with nuts, yogurt and condensed milk. Suggestion, go light on the liquid toppings and enjoy the fruit fresh. A bowl will set you back around a dollar. French food at La Taverne. La Taverne is supposedly one of the nicest, top rated restaurants in town. 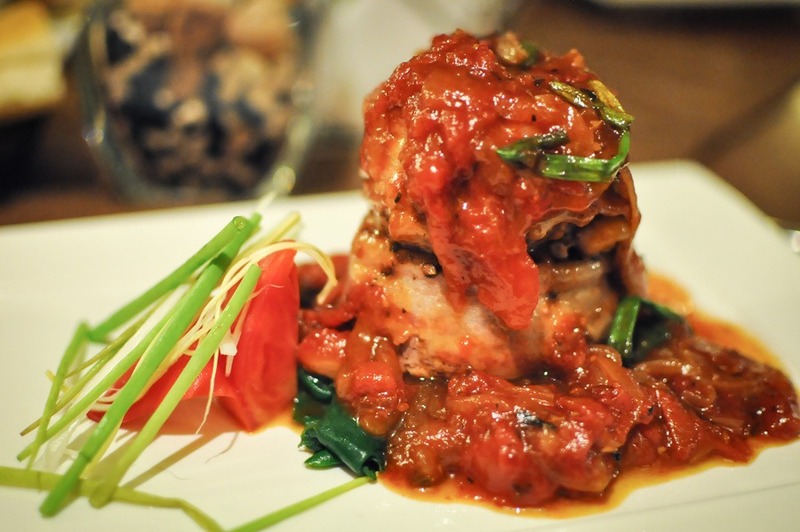 It’s cuisine has been described as Bolivian food with a French flair. Bacon wrapped lomo (steak) with sweet whisky sauce. Bread with soy sauce and local chilis. By Bolivian standards, especially when I can get a bowl of soup for about a buck, this was outrageously expensive.. but oh so worth it for the break from traditional food and a nice sit down dinner accompanied with wine. 130 Bs which was still less than $20. That’s a steal compared to similar fine dining restaurants in Western countries. Just to be clear, we didn’t actually order a pizza with chili soy sauce toppings – not sure one even exists. We ordered a simple cheese pizza with tomatoes and ham. It just so happens, it came with a side of chili slices marinated in soy sauce. In fact, I’ve seen it in a few restaurants and Bolivians would take their bread and dip it in the sauce. So naturally, I did the same with my pizza crust. It sounds strange but I loved it! 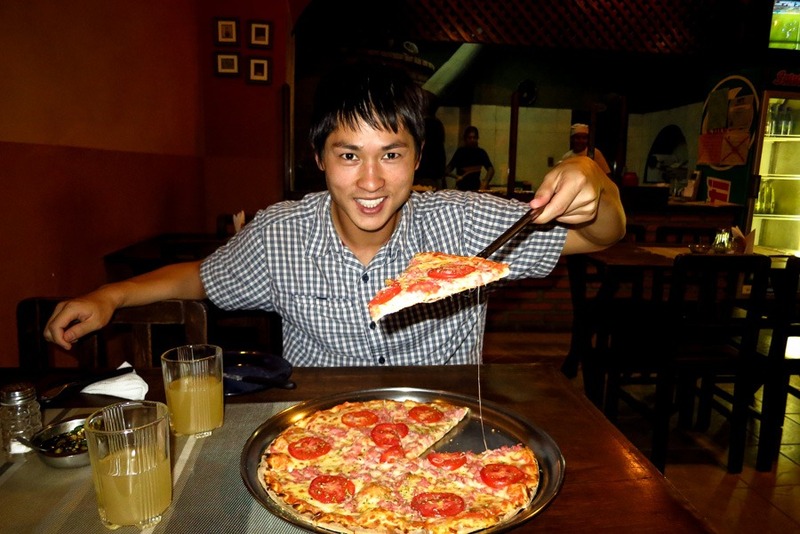 Sauce aside, The pizza was great considering it had real mozzarella cheese (rare in Bolivia) and a nice change of pace from traditional Bolivian food. Another favorite non-traditional Bolivian dish to have is the falafel/gyro shop right next door! This is one of Sucre’s best kept secrets. No signage, no real name really. Just a house number on a random street. Run by an Italian man, Roberto and his Bolivian wife, the couple serves up traditional Italian dishes like bruschetta appetizer, pesto gnocchi and carbonara. The place is closed on Sunday and Monday. Lunch with a view Café Mirador. 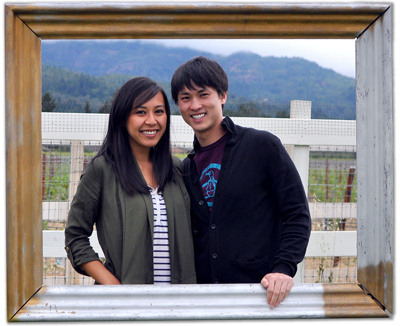 We spent one leisure morning on a short hike up the hill that overlooks the city. I forgot the name of the street, but it’s a popular street that leads to the white church at the top of the hill. 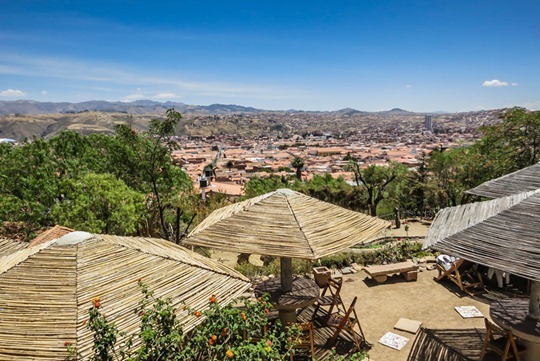 Café Mirador sits just on the ledge of the hill with a gorgeous panoramic of the city. The food is not much to brag about – you go here for the view. That said, they do make delicious smoothies to quench your hiking thirst before heading back downhill. Emapanadas at El Patio Saltenera. 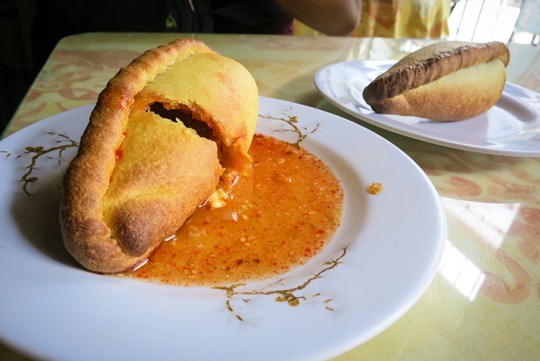 We had empanadas or salteñas on several occasions in Bolivia, most of which were bought from a street cart. This isn’t from a street cart. And it’s by far the juiciest, most flavorful empanadas we’ve had all trip long. Flores next door is another great option next door as well for tasty salteñas. A little cheaper and not as busy too. 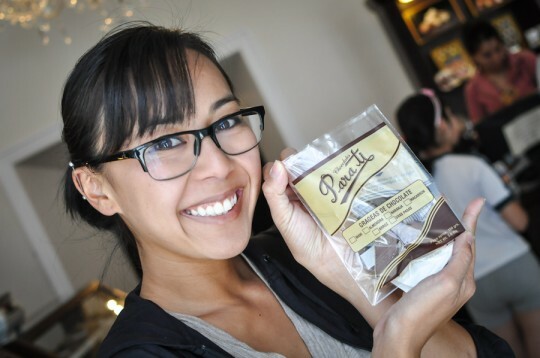 One last thing to add: Sucre is Bolivia’s chocolate capital, so be sure to stop by the popular gourmet shop, Para Ti and sample a few decadent treat! There you have it – where to eat while in Sucre, Bolivia. Got a place you’d like to share? Leave us a comment! I wished you had warned me. I am starving as I am reading this post. Peru will be on my list one day. Promise! There is not one thing on this post that I wouldn’t devour. Wow that salad bowl looks so yummy! The pizza and empanadas look phenomenal but trying food from market stalls? Not for me! that lunch with a view is gorgeos! and that fruit salad bowl looks SO yummy! I’m hungry now! yummmm. also the views from cafe mirador are gorge. love it all! You had me at chocolate capital and empanadas! Seriously, I must get to Bolivia soon! I am with Erin. Empanadas and chocolate sound like the new ying and yang of the food world. Great post, looks like you had a wonderful foodie experience! I’ve been living in Sucre for 2 months now (have 6 months to go!) and l love that there;s such a variety of dining options, and that it’s almost as cheap sometimes to eat out than in! My favorite place to eat at the moment is Condor Cafe for their Tucumanas…crazy delicious!